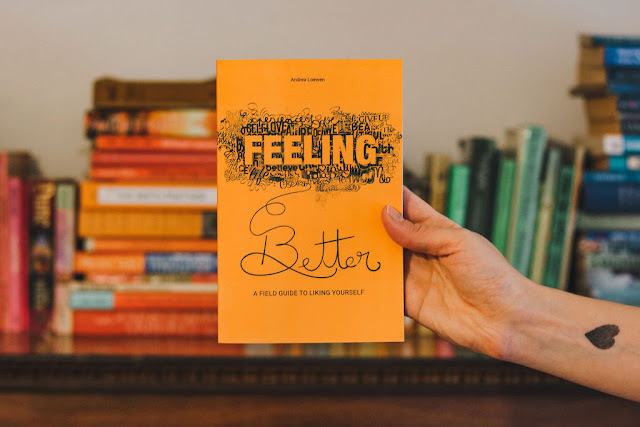 About the "Better" in "Feeling Better"
There is something I want to clarify about Feeling Better: A Field Guide to Liking Yourself. It's right there in the title: the word "better". What do I mean by that? It could be better as in "all better!" Where you previously had an issue and ailment and it's gone now! Done! Better! Check that off the list and never worry about it again! While that does sound nice, in a way, it also doesn't sound particularly realistic. What I meant by "better" is more along the lines of "improved." Like when you've been congested and you're finally able to breathe through both nostrils or you are learning how to play piano and you plunk out your first tune. It's better! Noticeably! You'll never really be done improving your piano skills or finding ways to be healthier in your body, but you can get to a point you're satisfied with and maintain it, knowing that someday you might want to work at getting even better. That's the kind of better I mean. Progress that is incremental. Where you can see that things have changed, and that they can continue to do so. Where you feel better than you did before, and maybe even see a future where you feel even better than you do now. Where there is always room for growth. I don't know about you, but that seems like a big relief to me.